How we ended up in the small town of Ketchikan, Alaska, literally 48 hours after the close of cruise ship season, is a story for another day. But being in such a small town at such a quiet time gave us the perfect opportunity to see it in peace and to meet quite a few locals on our way through. One of them recommended a visit to the Saxman Village, just out of the centre of town – we dutifully waited an hour for the one bus servicing Ketchikan and hitched a ride out to Saxman. 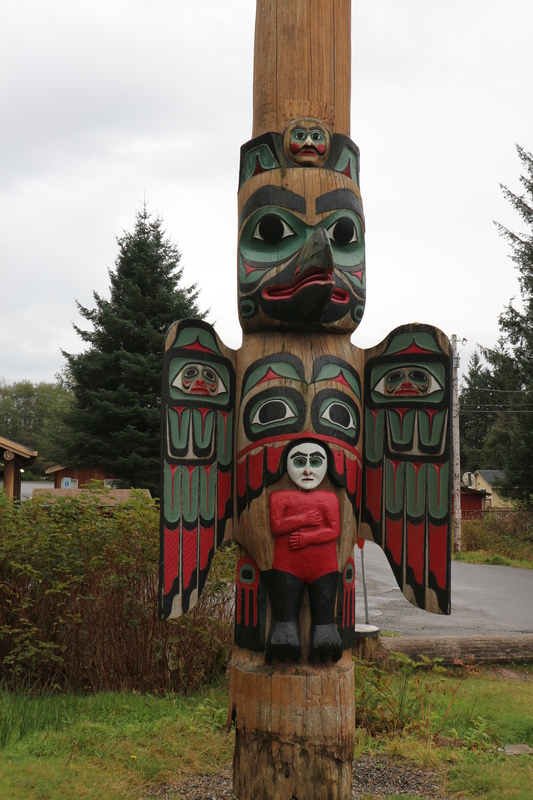 In tourist season, there are shuttles that head out there, and day tours – on arrival, you pay your entry fee, can follow someone around who can tell you about everything you’re seeing, and even get to watch some totem pole carving in action. We had missed tourist season, so we were on our own. The bus driver was kind enough to tell us when to get off and direct us to the correct street – luckily, because if not for her directions, there wasn’t much else to point us the right way. 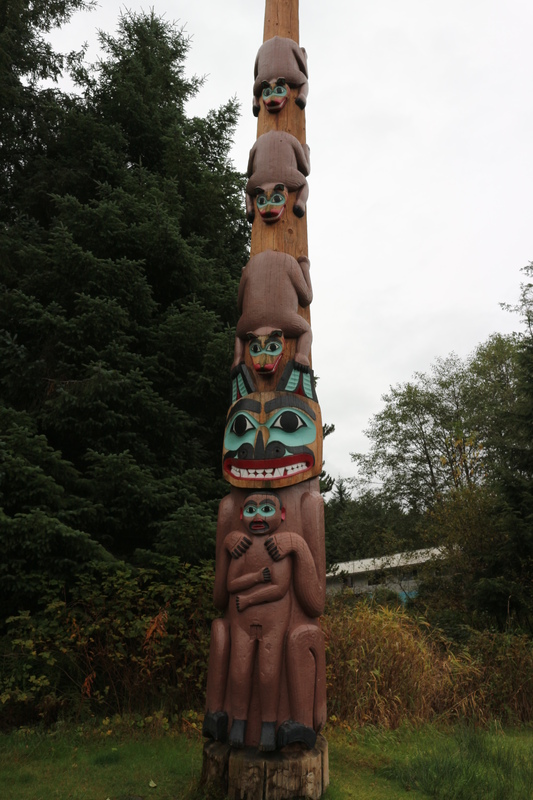 We walked up a pretty quiet and residential looking street, and found the totem poles guiding the way. 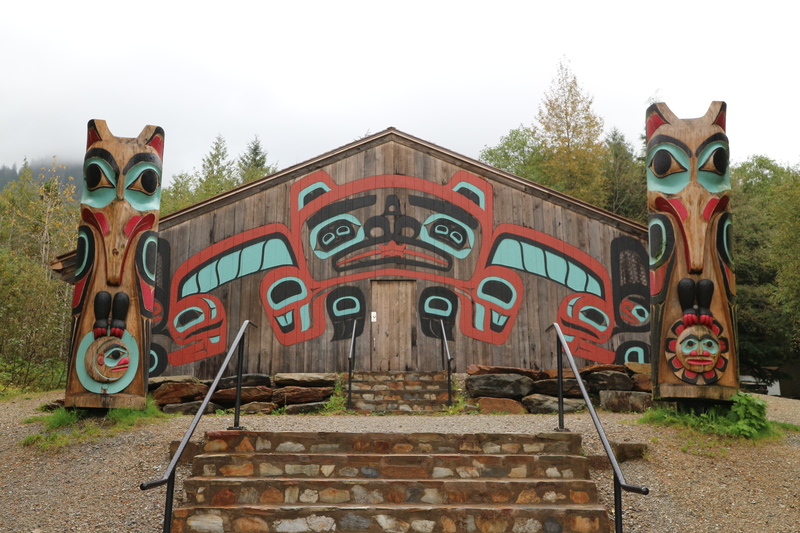 Tlingit Indian Village, established 1894, is named for school teacher Samuel Saxman, one of three men lost Dec of 1886 while scouting for a new location for people of Tongass and Cape Fox Villages. 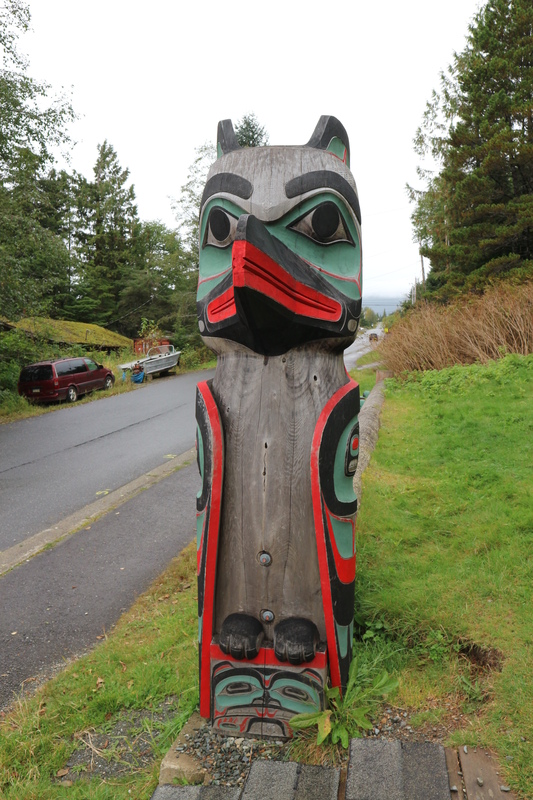 Totems here, comprising world’s largest collection, including poles moved from Pennock, Tongass, and Village Islands, and from Old Cap Fox Village at Kirk Point. Many are poles restored under federal works project directed by the U.S. Forest Service beginning in 1939. The clan house, the centre of the village, was magnificent. The façade is decorated with a tri-coloured beaver, the clan’s crest. Traditionally, the clan houses housed several families from that clan, and also doubled as a clan function centre, and in tourist season, it is opened to the public. We just got to enjoy it from the outside, which was pretty magnificent, anyway. 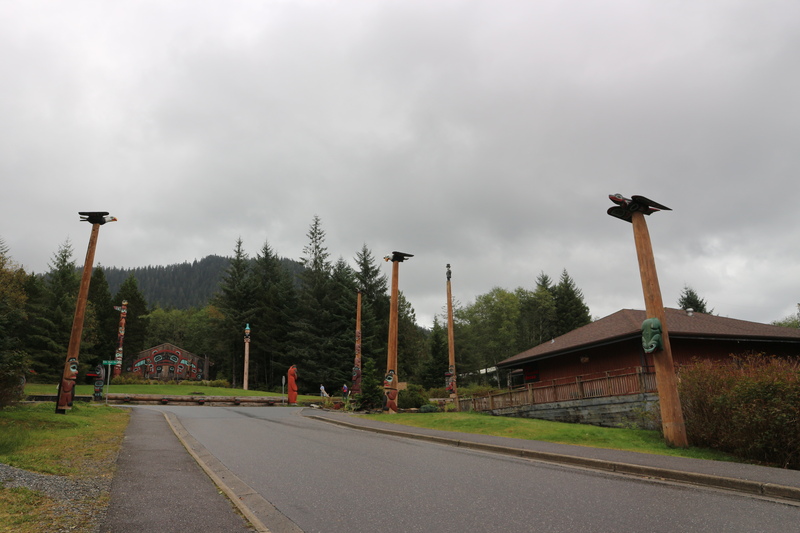 After spending a bit of time walking around and staring up at the enormous totem poles, it looked like it was about to start raining again. We made our way back to the bus stop and hoped it wouldn’t be another hour wait – as luck would have it, the bus saw us coming and waited for us so we’d have a ride back to town. It’s so nice that the bus driver waited for you guys Jess:) I love the totem poles too, the colours & stories… reminds me of a sight in Vancouver. The book you mentioned sounds intriguing! It really was – she was so lovely and knew everyone on her bus! I’ve heard Vancouver has some incredibly totems, I’d love to see them!